Here is the card I made for my Dad's birthday this year. He loves playing cards, and the "In the Cards" wheel was perfect to make his card. I inked up the wheel in Real Red Classic ink and then used a blender pen to remove the ink from the spades and the clubs. Then, using a Basic Black marker I added back color and then rolled the wheel onto a strip of Whisper White card stock. 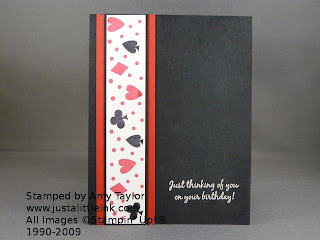 With a little layering and an embossed bithday message onto the Basic Black card it was complete.